Six Pack are beautifully bundled and tied in our signature WoolyLady ribbon. 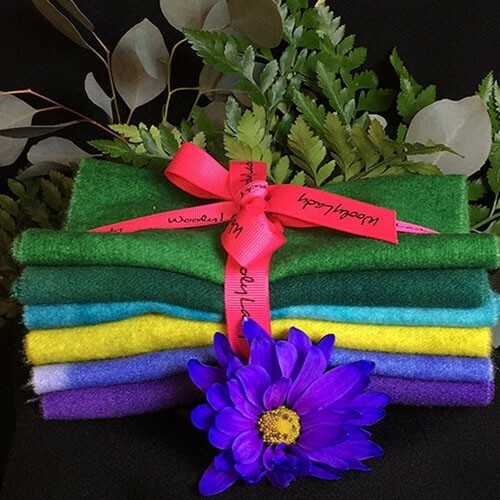 Each Six Pack contains six pieces of our beautiful, hand dyed WoolyLady wool. Each piece of wool within the Six Pack measures about 6" x 16" (that's a fat sixteenth). This size is perfect for hand appliquers and rug hookers. Colors include: Amethyst, Periwinkle, Grasshopper, Mediterranean Ocean, Peacock and Grass Green.